The city of San Diego began here in the 1820's, at a time when California was part of Mexico. The Mexican heritage has been preserved during the restoration of Old Town into a State Park. Size: approximately 8" x 6"
Shown below is an enlarged section from this map. Interested in a walking tour of the park? Check out my Old Town San Diego walking tour. 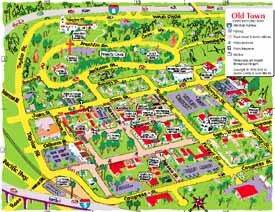 Click to go back to the basic page describing the San Diego Visitor's Map.